I’m going to start a new religion. I think I’m going to call it the Temple of the True Believers or something like that. There will be no specific, written doctrine, so anyone with any beliefs can join. Then, I’m going to start ignoring the laws I don’t like because that is what my deeply held religious beliefs tell me to do. There are so many possibilities, it is mind boggling. In fact, this is the time to really apply my imagination. I have even gone through the trouble of selecting a religious symbol. 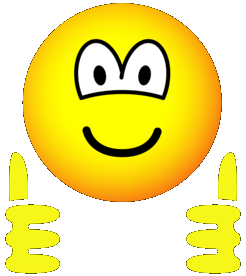 I picked it because it is a happy face that gives two thumbs up. That means you have the approval of the Temple of the True Believers to do whatever your deeply held religious beliefs tell you to do. In other words, if it makes you happy (one of the basic tenets of this new religion), do it. There is no meanness in this new religion – hence the happy face. I have also selected the first piece of music for the liturgy. Make yourself HAPPY, and listen to it at least once a day. It will do you good – physically and, I guess, spiritually since this is, after all, a religion. I am going to go into my friendly, neighborhood bank and demand a few hundred thousand dollars. I am a socialist, and I don’t believe anyone should have that kind of money. Since banks have a lot more than I do, I don’t believe that is right according to my deeply held religious belief in pure socialism. I will take that money and help other people. I will stop paying taxes. I don’t approve of the job the government is doing, so why should I support it. According to my deeply held religious beliefs, I feel it is my obligation to stop financially supporting a government I feel is corrupt, etc. I will stop paying my bills (See #1. Remember, I am a socialist.). I can see that this ruling could end up being a really good thing. After all, most of us have deeply held beliefs. Now, all we have to do is call them religious, and we’re good to go. I guess I have the Supreme Court of the United States to thank for all of this. Posted in Philosophy/Ideas, Satire, Taboo 2 by Randee Head with no comments yet.